Molecular biology can be somewhat perplexing at times. However, not in the way that people generally assume. Molecular biology tends to bring along some assumptions about inherent complexity. And this is often the furthest thing from the truth. In reality, molecular biology often sheds light on the very simple parts which make up complex processes. By understanding the building blocks of biology, one can often create a wide variety of innovative solutions. Understand how bricks function and one can rebuild a damaged structure, or perhaps even construct one from scratch. Understanding the building blocks of biology and one can perform analogous feats at a cellular level. A recent example of this process in action can be found with peptide research. 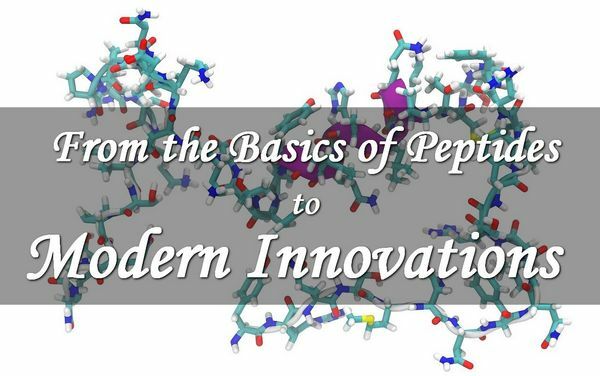 A peptide isn’t the simplest element of biology. But it’s fairly close to that point. The technical details are a bit more complex than this simple description. But one can understand it as a progression in complexity from amino acid to peptide to protein. Another popular analogy compares biology to language. An amino acid is analogous to words and the peptides to full sentences. The amino acids are themselves usually created by breaking down the more complex structure of a protein. This protein matter is usually taken in through a living being’s digestive system. From there the mass of amino acids are used and combined to form a number of different active elements. But the peptides are among the most fascinating of these elements. They’re notable in part for their relative simplicity. Peptides generally consist of under fifty amino acids, where a protein consists of polypeptides bound with ligands. It’s easy to see how this fits into the earlier linguistic analogy. But the simplicity of a peptide also allows for more efficient intervention by researchers. In fact, they can easily utilize Custom Peptide Synthesis to investigate theories or treatments. A peptide usually acts in one of two major ways. It’s either incorporated into a larger protein structure or it’s used as a method of biological communication within a larger system. As a communication agent, it essentially latches on to cell surface receptors. But one interesting point is how and where this happens. Communication within the body is usually quite different when it happens in either the brain or the rest of an organism. But peptides are unique in that they can essentially function as neurotransmitters within the brain. Or they can work with non-neuronal cells in the rest of the body. On a practical research level, peptides are used for many different purposes. And this tends to mirror the interests of the culture around it. Right now, food waste is a huge concern. It’s often difficult to secure and distribute a sustainable food supply to the world at large. But researchers have started working with CLE peptides as an agricultural agent. Peptides exist and work in plants just as much as they do in mammals. And the CLE peptides have been shown to regulate growth. This is showing huge potential for increasing overall growth. And in turn, later down the road, there’s potential for increasing overall distribution due to more efficient growth cycles. This could prove a huge step forward in the fight against starvation or malnourishment. Another example can be found in something we’ve all experienced. Researchers have found that the urge to cuddle may well be regulated by a peptide called oxytocin. It’s also probable, based on mouse studies, that it helps regulate feelings of attraction and even platonic friendship. The power of peptides can’t be overstated. And at the same time, one can’t overstate the importance of a new field of synthetic peptide production. New peptides can be designed in the lab. And they have all the strengths and applications of standard peptides. Sometimes this might mean a 1 to 1 recreation of existing peptides. Or it might be something new. The fact that peptides are capable of so many things has already made synthetically produced peptides a favored method of extracellular matrix construction. And they’re proving to have applications as a method of cancer treatment as well. The future is always hard to predict. But it’s clear that research into peptides is yielding some amazing results.